Joseph Badame built a house designed to protect his friends and family against anything. And while he tried to anticipate every possible scenario, he couldn't have imagined how his extreme preparedness would end up helping people he had never met, on an island far away. On Relate: "Lessons from a hurricane"
TAMARA STANNERS:	Medford is a small town in New Jersey. About 24,000 people. It's only 20 miles from Philadelphia. There's a dead end street in Medford that's lined with several really nice, large houses. Most of them have swimming pools. That kind of nice house. But there is one house that's different. Unlike the rest of the houses on the street, this one was designed to withstand pretty much anything. Like nuclear war, or civil unrest, or hurricanes. The couple who built and designed the house, well they were prepared to keep their friends and their family safe, whatever happened. But a twist of fate meant that they were actually prepared to help people they'd never even met. That's what's happening today, on Relate. I'm Tamara Stanners, and this is Relate, by Zendesk. Producer Andy Sheppard is here again. This time, you get to talk about the fun things, like doomsday stuff. TAMARA STANNERS:	Yeah, it's kinda wild. ANDY SHEPPARD:	Well, and it's top of the mind too, right? TAMARA STANNERS:	Mm-hmm (affirmative). Now when you say doomsday preparation, most of us think of putting together a kit. Which I do have. Flashlight, batteries, canned food, bottled water, that kind of thing. ANDY SHEPPARD:	Yeah that's the sort of thing that you'd typically imagine. But the characters in this story took it to the next level. And then they took it like five levels beyond that. JOSEPH BADAME:	The house was built using commercial technology. Instead of wood construction, the outside walls were what they call fluted concrete block, so the walls were almost a foot thick. And it had double quarter inch tempered glass windows. ANDY SHEPPARD:	Joseph Badame is a licensed architect, and so he knew what he was doing, and he wasn't messing around with half measures. JOSEPH BADAME:	It was basically divided into five sections, I would say. There was the main house, and there was a separate two-bedroom apartment, and a efficiency apartment for my mother-in-law. And it had a full basement, which doubled as the survival bunker, I guess you would call it. It was totally buried. It was designed as a shelter for storms, for hurricanes, for civil disobedience, riots, you name it. And within that was a small radiation shelter, in case of an atomic attack. TAMARA STANNERS:	Oh, he seriously wasn't messing around. ANDY SHEPPARD:	No, I mean this home expanded to 8,500 square feet. There were several kitchens, there were separate shower rooms, banks of washing machines and dryers, and enough room to accommodate 100 people. TAMARA STANNERS:	What? 100 people? ANDY SHEPPARD:	Yeah. That's a lot of mouths to feed, and Joseph had worked out a system for this as well. JOSEPH BADAME:	Over the years, I started accumulating mostly dry food. Food that could keep for decades. And I devised my own system of 55 gallon barrels with plastic liners, and then placing food in plastic bags, and packing them tightly, and then filling the barrel with nitrogen, and sealing it. TAMARA STANNERS:	Okay but why did they build this thing? ANDY SHEPPARD:	Well, it was a labor of love for Joseph and his wife, Phyllis. They began building this house in the early 1970s. The two of them had returned from a two year stint in Tunisia, with the Peace Corps. JOSEPH BADAME:	And when we came home, it was 1970, and there were riots all over the country that were pretty severe, and some of them were in our own back yard. We lived very, very close to Camden, and Phyllis had two sisters that lived in downtown Camden, who had their apartments burned, and as a result, both of us came to the conclusion that we probably should get away from the urban area. It did not seem like the future was very good there. So we started searching for land as far out as we could afford. We wound up buying a lot in Medford, New Jersey, and building a house that was suitable for any crisis that could come up. ANDY SHEPPARD:	So they built the house, and settled into Medford, and they were prepared for pretty much anything, except for this. In 2005, Joseph's wife Phyllis had a massive stroke. JOSEPH BADAME:	That paralyzed her on her left side, blinded her in one eye. She had already lost her hearing in one ear, and unable to do anything for herself. So I pretty much stopped work. My partner took over most of the responsibilities. ANDY SHEPPARD:	Doctors didn't expect Phyllis to live beyond a year or so, but she was well enough to do some traveling, so Joseph took out a line of credit, so they'd have some money to travel around. He wanted their last years together to be as special as possible. JOSEPH BADAME:	I guess what happened was, I took such good care of her, instead of living for a year, she lived for eight years. But all during that time, we still continued our preparations, but they got more critical, because we were running out of money. I took out a huge, 500,000 dollar loan on the house. We had spent all of our savings. I had my own business, so I didn't have a pension, or a retirement program. ANDY SHEPPARD:	In 2013, Phyllis died from another stroke, and Joseph was left in a dire financial situation. JOSEPH BADAME:	And so by the time she died in 2013, I had a 500,000 dollar loan on the house, and a couple hundred thousand dollars in other borrowed money. TAMARA STANNERS:	Oh, that is an unimaginable sum to deal with, especially for someone at Joseph's stage in life. ANDY SHEPPARD:	Yeah, I mean it's not like he can start over again. JOSEPH BADAME:	I managed to continue for three years after she died, but then it was apparent that I just couldn't keep up. So I defaulted on the mortgage about a year ago. ANDY SHEPPARD:	So this all seems pretty bleak for Joseph. And it is. I mean he was gonna be evicted from his house, and he was forced to have an estate sale. But here's where the silver lining kinda starts to peek through, a little bit. JOSEPH BADAME:	The net result was, the house was just loaded with stuff. Good stuff, unused, all in boxes. A lot of survival stuff. 4,000 rolls of toilet paper, dish detergent, laundry detergent, disinfectants, everything. TAMARA STANNERS:	And there was also all of that food. ANDY SHEPPARD:	Yeah, well it turned it to be 30,000 pounds of food. TAMARA STANNERS:	Are you serious? ANDY SHEPPARD:	Yeah. 30,000 pounds. JOSEPH BADAME:	I had already attempted to contact local food banks, and soup kitchens and so forth. And the big issue with all of them was they had no means of transportation, or man power to get it out of the basement, get it in a truck, and get it to their place. ANDY SHEPPARD:	Now the company that ran the estate sale hired a food truck to sell snacks to people coming by the house to look around, and Victoria was running the truck. VICTORIA BARBER:	My name is Victoria Martinez Barber. This was like the day after Maria hit, so this is September 21st. ANDY SHEPPARD:	This was the day after hurricane Maria had devastated the island of Puerto Rico. Victoria has a lot of family there. VICTORIA BARBER:	So we hadn't heard from our family in that time yet. The last thing we heard was we got a message the 20th, at 8:00 in the morning, that they had to evacuate, and were on the roof, waiting to be rescued. JOSEPH BADAME:	And they were devastated. Two days before the estate sale, Maria hit, and they were not able to contact her family, and were looking for a way to help them. VICTORIA BARBER:	I was in shock, and then I would go through bouts of just crying. And thankfully, and my husband Anthony is more of a get the job done kind of guy, so he can kind of pull me out of the crying, the depression, and say, "We gotta keep going." So we met Joseph, and I had a sign out there, that all of my proceeds for my food truck would go to Puerto Rico, and Joseph was the first person to donate, and the only person to donate in fact, that weekend. And he donated $100. ANDY SHEPPARD:	Joseph Badame, the man who was being evicted from his own house, donated money. But he was about to give a whole lot more. VICTORIA BARBER:	Now Joseph, after that, we got talking. He said, "Come down to the basement, and if you can get the food out of there ... you can haul it out of there, you can have it." And going down to the basement, I was anticipating a food pantry. I was not prepared for an entire room and barrels of food. It was just ... I was overwhelmed with joy, and ... because it was truly life changing for me, at that moment. Because not only would I be able to help my family, but I would be able to help thousands with that amount of food. TAMARA STANNERS:	What an absolutely incredible turn of events, for everybody. For all of them. ANDY SHEPPARD:	Right, well so, I mean, all this time, Joseph was really worried all this food was gonna go to waste. There were 80 barrels, and each of these barrels had 360 pounds of food. And then here was Victoria, and her husband Anthony, who had so many people that they knew could use this food. JOSEPH BADAME:	Quite frankly, I was somewhat skeptical that so much food, literally tons of food, could be gotten to Puerto Rico, and distributed by this little [inaudible 00:12:07]. Victoria is five feet tall, she weighs 100 pounds, and she's a fireball. TAMARA STANNERS:	But how did they get it there? 30,000 pounds is a lot of food to move. ANDY SHEPPARD:	Yeah, no kidding. Victoria and her husband had to figure out logistics, and that was not easy. They tried renting an 18 wheeler to get it to a port in Florida, but because of some obscure law in the books, they weren't gonna be able to ship it to Puerto Rico. Victoria tried everything she could think of, to get the food there, but she was stuck. VICTORIA BARBER:	So then at that point, I went to Facebook, and I was just hysterical. I wanted someone to help me get the food there, and that is when ... a family friend works for a company in Puerto Rico, and sells high end art. They got a Delta flight, and we were able to send 24,000 pounds of food. ANDY SHEPPARD:	Yeah. It really is. Because everybody sprang into action to get this food organized, and off to the airport, but before the barrels were all loaded up, Joseph did one very special thing. JOSEPH BADAME:	And that morning, I got up very early, and I printed out pictures of Phyllis, my wife, and on the picture, I put [Foreign Language 00:13:31], from your friends in America. TAMARA STANNERS:	Oh, that is so beautiful. What an amazing legacy for her. But what did Victoria and Anthony face, when they got to Puerto Rico? ANDY SHEPPARD:	Well, the food got there ahead of them. They had arranged for it to be loaded on trucks, and brought into Arecibo, and they arrived at the end of October. And Arecibo, like most of Puerto Rico, was devastated. But they were about to see just how much Joseph's gift would help the people of Arecibo. VICTORIA BARBER:	One barrel feeds 80 people for about four months. And there were 40 barrels. So this is helping, I mean, hundreds of people. JOSEPH BADAME:	No one fought over them, nobody was stealing them, and the first reaction to the neighbors, when they saw Anthony and Victoria show up with their backpacks, and their rented van was, "Can we help you?" So everybody shared, everybody was orderly, friendly, grateful. All the emotions that you would not expect in a crisis situation, five weeks after a storm hit. It didn't hit me until I saw pictures that Anthony and Victoria were sending back, showing the barrels sitting in Puerto Rico, in front of her grandmother's house. And you could see the pictures on the barrels. And at that moment, it dawned on me, what we had done. And how massive the effort was. And that it had been successful. And it just warmed my heart, when they said people were cutting off the pictures, and keeping them. That was particularly heartwarming. TAMARA STANNERS:	So for now, are Anthony and Victoria back in New Jersey? ANDY SHEPPARD:	Yeah. They're back home, and they've raised more money, and they have 40 more barrels of food that they're gonna send, and they're planning on doing more fundraising, and they're gonna go back in late December, along with the rest of that food. TAMARA STANNERS:	That's incredible. And what about Joseph? ANDY SHEPPARD:	So I think it's bittersweet for Joseph. I mean it's a difficult situation for him to be in, but all of this work that he had put in has been worth it, because it has helped so many people. JOSEPH BADAME:	By helping Puerto Rico, in their hour of need, and at this end, the people that have salvaged me and caused me to have a positive outlook on life. VICTORIA BARBER:	I believe that everyone can learn from Joseph. I mean he's just ... he's probably the most ... well he is the most humble person I've ever met. And he's an expert. And I never thought about a mass catastrophe happening. But it happens, and it hit me directly to my core. So I believe that ... I thank God for his efforts. Even if we just prepare for a little bit, prepare for your own family, I think you would be better off. TAMARA STANNERS:	Victoria and Anthony have set up a GoFundMe page. Just search Arecibo hurricane relief, at GoFundMe.com. And Joseph has been living in a motor home on Victoria and Anthony's property. He'll be moving it permanently to another friend's property, but for now he's there, and he's okay. Special thanks to Tina Pittaway, who battled technology snafus, and escaped pigs to bring us this story. And thank you Andy. ANDY SHEPPARD:	It is my pleasure. TAMARA STANNERS:	Hopefully you never have to deal with a scenario like that, but it's easy to get blindsided by unexpected events. And 30,000 pounds of food might be overkill, but it's still really important to be prepared. There's a very useful article in the Relate online magazine called, Crisis Lessons from a Hurricane. It talks about how to apply the experiences from a major disaster like that, to the less life-threatening, but still important day-to-day crises we all face. You can find that article, and lots more useful stuff, at Relate.Zendesk.com. That's it for Relate, but we've got another episode coming your way in a week. In the meantime, subscribe to Relate for free, on Apple Podcasts, or wherever you listen, and we'll get that episode to you automatically. 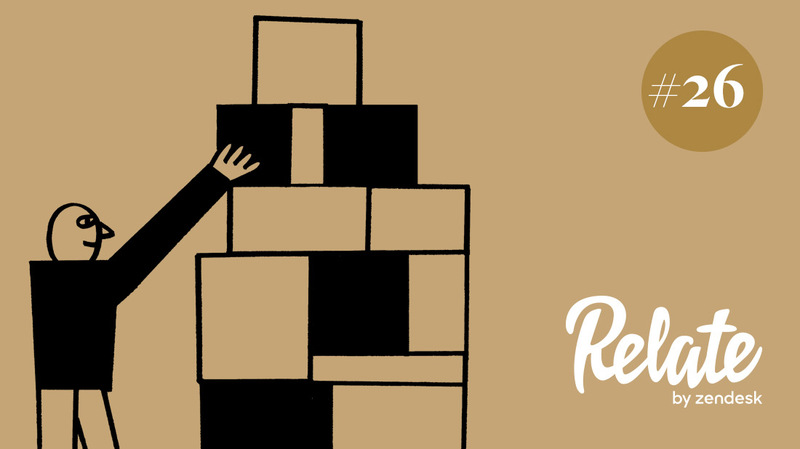 For articles on how to connect with your customers in deeper, more meaningful ways, visit Relate.Zendesk.com. And for a free trial of our customer service software, check out Zendesk.com. I'm Tamara Stanners, talk to you next week.